A year on, Investigator Still in Control of His Own Destiny! 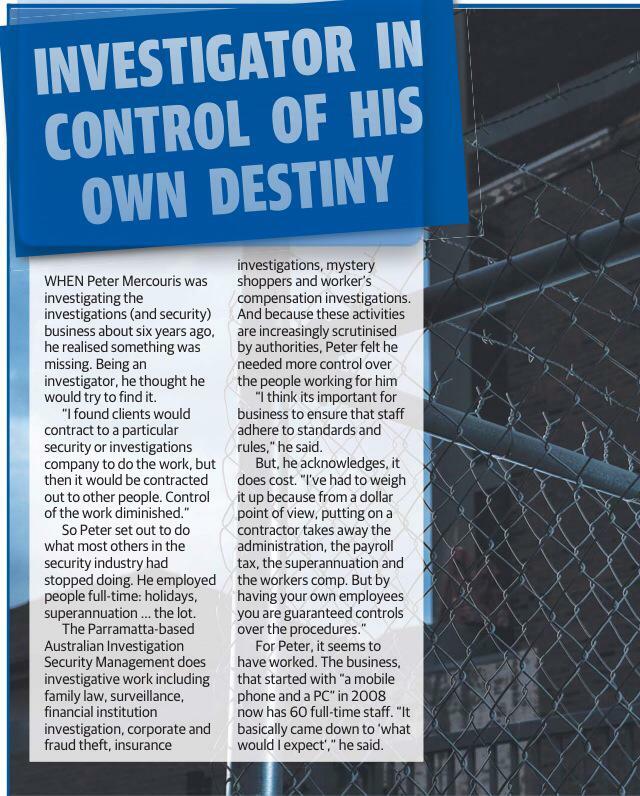 In July of 2014, AISM’s principal Mr Peter Mercouris was contacted by The daily Telegraph’s journalist Mr Ross Greenwood to discuss the success that his company has achieved by not subcontracting their man power. A year on, Mercouris continues to abide by his policies and procedures as the company continues to grow in the security, investigations and legal support departments. 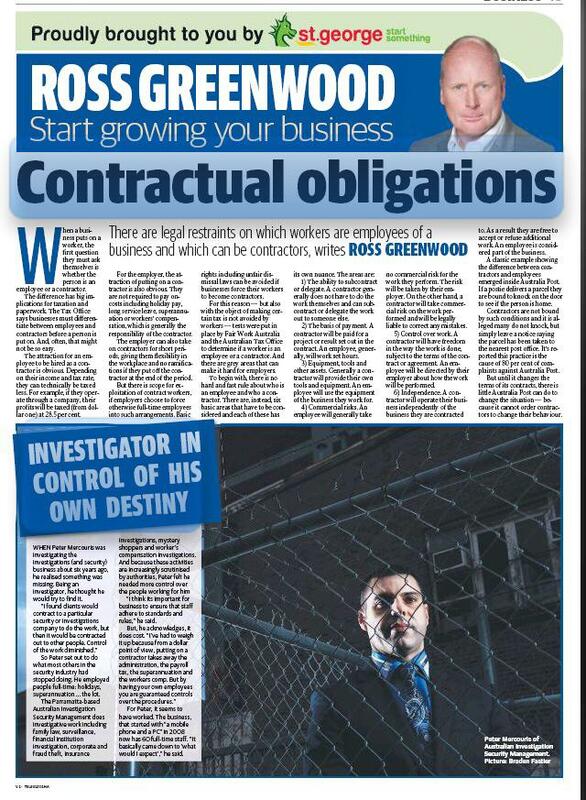 A year ago today, AISM’s Principal Peter Mercouris appears in the Daily Telegraph after being contacted by Journalist Ross Greenwood to discuss the benefits of NOT subcontracting its man power. 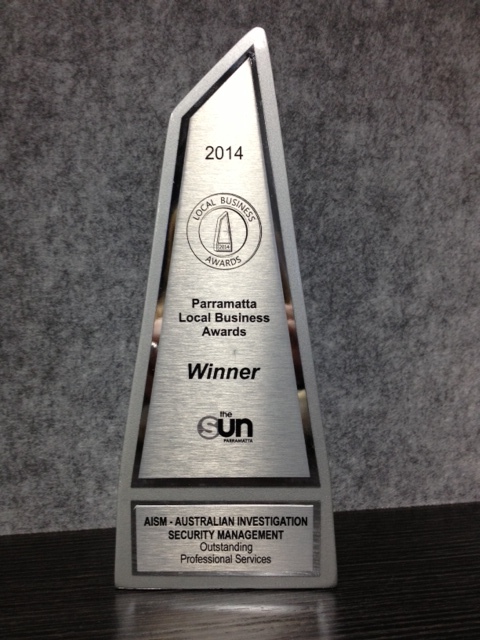 June 2015 Marks 7 years since Australian Investigation Security Management was established. AISM was established in 2008 by Peter Mercouris using local and international research and a unique understanding of compliance and pro-active approaches to Security Risks and standards. With a team of skilled experts, AISM was formed to provide a cost effective, professional, timely and transparent service. Peter’s extensive experience extends 18 years prior to AISM where he gained expertise in legislation, compliance, pro-active and re-active crime management, security and criminal processes in the NSW Police force. AISM started off with a mobile phone and a PC and now has over 60 employees and a varied client base including small and large businesses, independent clients and legal support. AISM would like to take this opportunity to thank all of our clients for their business, and we are looking forward to further success and growth in the future. 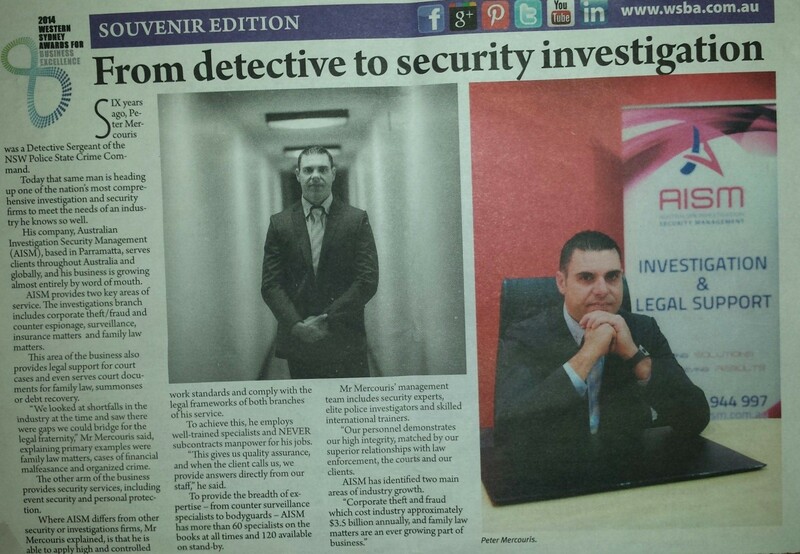 AISM’s principal and our business is featured in an article in the Western Sydney Business Access September edition. 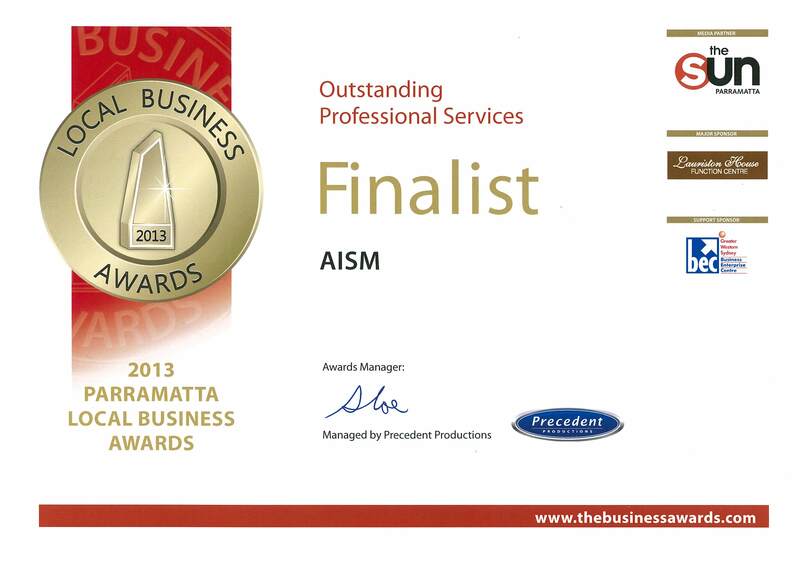 Congratulations to the AISM team on achieving and in being nominated as Finalists in the Excellence in Professional Services at the WSABE awards, last Friday night. 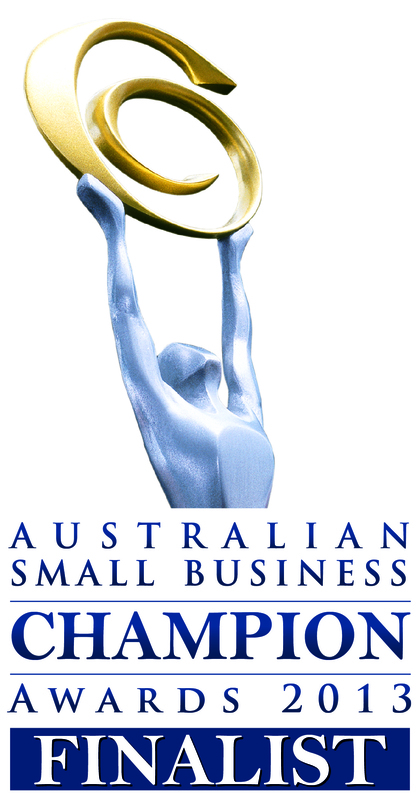 AISM is honoured by having have our services acknowledged and awarded Winner for the category of Outstanding Professional Services in the 2014. 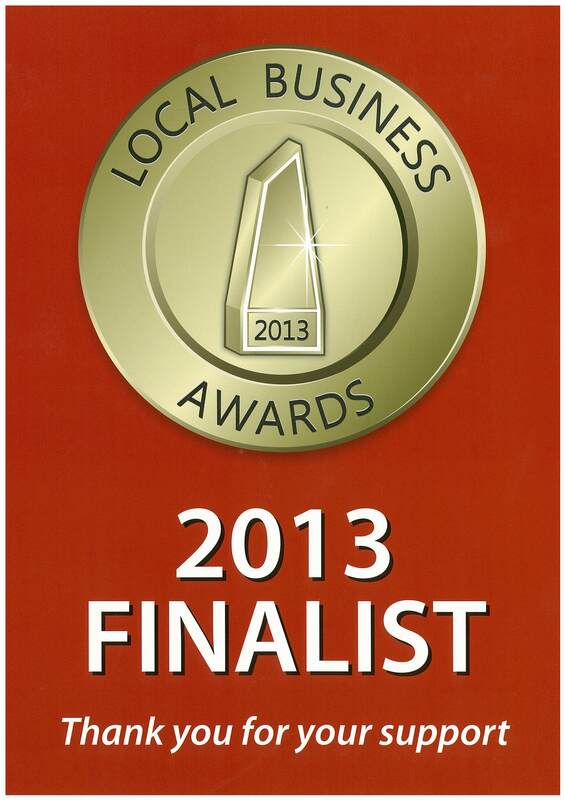 We would like to thank all our staff and business partners and look forward to continued success. DO YOU KNOW WHO YOU HAVE LET INTO YOUR BUSINESS ? It has become common practice for a company to win tenders or contracts to provide you with services, whether it be investigation, security or anything else. That company then sub-contracts and the sub-contracting company is not prevented from engaging a further sub-contractor and so on. So who is your service provider? Who have you let into your business? The questions are endless. Here at AISM Security and Investigations we pride ourselves on creating partnerships with clients and providing them with OUR service. We do this simply by NOT sub-contracting our man power. Our clients KNOW who they have established a partnership with and allowed into their business. The question is do you? On Sunday 10th August 2014. There was a fire at one our venues, where the entire Club needed to be evacuated. It was peek trade time at the time of the fire and there were approximately two thousand (2000) patrons and guests inside the venue. In a joint team effort AISM Security and Club Management evacuated and cleared the entire building, moving patrons and guest to the assembly areas within eight (8) minutes. AISM and staff have received great praise from club management and praise from fire authorities for their execution of evacuation procedures. AISM’s very own Principal Peter Mercouris has been chosen by Ross Greenwood to discuss the benefits of employing staff instead of subcontracting work out. In a separate article, Ross Greenwood writes that contractors are not bound by the characteristics of the company, whereas employees must adhere to company standards. AISM only employees staff and does not adhere to subcontracting principles. About 2.45am on Sunday (6 April 2014), police were called to a hotel in Crystal Street after reports that a man had been struck with a glass. Police from Marrickville Local Area Command located a 30-year-old man who had allegedly been struck to the side of the face with a schooner glass during an altercation near the dance floor. The man was treated at the scene and conveyed to Royal Prince Alfred Hospital for treatment to the laceration which will require stitches. A 35-year-old man was arrested by officers and taken to Newtown Police Station. He was later charged with assault occasioning actual bodily harm. Both men were well affected by alcohol. About 7.00pm on Sunday (6 April 2014), a man entered the hotel on Minto Road armed with a firearm. Police have been told the man jumped the counter and threatened staff, demanding money. He fled with a sum of cash and police were alerted. Officers from Macquarie Fields Local Area Command attended and commenced inquiries. They’re appealing for public assistance in an attempt to identify and locate the man involved. He’s described as being Pacific Islander / Maori appearance, approximately 185cm tall and with solid build. About 9.30pm on Saturday (5 April 2014), a 36-year-old man was at a hotel on Byng Street when he and another man were involved in a verbal argument. Police have been told the 36-year-old was asked to leave the hotel. As the man stood outside a door of the hotel, an altercation allegedly occurred between him and another man, resulting in the 36-year-old man falling backwards down a flight of stairs. The man hit his head on the bitumen, sustaining an injury to the back of his head. On Sunday 6 April 2014, the man attended Orange Hospital, where it was established he had sustained a fracture at the base of his skull and internal bleeding. He was airlifted to Westmead Hospital in a stable condition. His injuries are not believed to be life-threatening. Police from Canobolas Local Area Command attended the hotel and established a crime scene. Detectives are now appealing for anyone with information about the incident to come forward. FOUR male teenage detainees have threatened security officers with a knife before fleeing in a prison van on the NSW north coast. At 4.30pm (Sunday 2nd March 2014), police were called to North Street in Grafton where the teens allegedly threatened two security officers with a knife. The security officers and another detainee got out of the van. Police say four detainees, three aged 18 and one 15-year-old, then allegedly took off with the juvenile justice van. The vehicle was found on Redgum Road shortly after. However the detainees are still on the run. About 9.20pm (Saturday 1st March 2014), a 15-year-old girl was indecently assaulted on Flinders Street, Surry Hills, as she watched the parade. A 25-year-old man was detained by a nearby security guard who alerted police. The man was arrested and taken to Surry Hills Police Station and charged with aggravated indecent assault. About 2.25am (Sunday 2nd March 2014), police attended a licensed premises on Oxford Street, Surry Hills, following reports of an assault. A 25-year-old man was treated by Ambulance Paramedics for facial injuries and taken to St Vincent’s Hospital for further treatment. A 23-year-old man was arrested and charged with assault occasioning actual bodily harm. Police arrested a man following a disturbance at a hotel in Wakefield Street in the city. At about 12.45am (Saturday 1st March 2014), police received reports of a fight at the Wakefield Hotel. Witnesses told police there had been an argument between two men in the outside dining area, when one of them allegedly picked up a glass and struck the other man in the face. The suspect left prior to police arrival but, was located a short distance away on Pulteney Street and arrested. A 22-year-old man from Felixstow was charged with aggravated assault cause serious harm. The victim received lacerations to his face and was taken to hospital for treatment. He has since been discharged. Police are investigating an attempted robbery at a hotel in Klemzig. Just before 12.30am (Saturday 1st March 2014), three men went to enter the gaming room of the OG Hotel but were stopped by security staff. One of suspects was allegedly armed with a machete and another with what was believed to be a metal bar. The suspects fled after being confronted by security staff and were last seen heading towards OG Road. Police are appealing for information after the robbery of a registered club at Nambucca. Shortly before 9pm (Sunday 23 February 2014), the last patrons left a registered club in Short Street. A 56-year-old woman commenced the closure of the club and was counting money from the cash registers when she was alerted to breaking glass. The woman was confronted by four males, armed with a brick, a crowbar and bat. She attempted to call triple zero (000) but had the phone pulled from her grasp by one of the males. The woman was then forced to a rear office and made to open the safe. After taking the cash the men fled from the premises and police were notified. Officers from the Mid North Coast Local Area Command and a police dog tracked a scent along a nearby street and several items from the robbery were located and seized for forensic testing. Despite the search the four men could not be located. None of the four employees in the club were injured during the incident. Anyone with information about unusual or suspicious activity around the club yesterday is urged to come forward. A woman has been charged following a glassing in Ballina. About 12.30am (Sunday 23 February 2014), a 39-year-old man was at a club on Cherry Street when an argument broke out between him and a 47-year-old woman. The woman allegedly struck the man with a schooner glass, hitting the side of his face. Security staff detained the woman at the scene until police from Richmond Local Area Command arrived. As officers attempted to arrest the woman, she allegedly became aggressive by thrashing around and kicking police. The woman was refused bail to appear at Lismore Bail Court (Sunday 23 February 2014). The man sustained a small laceration to his face but did not require medical treatment. TOUGH new liquor sales laws and pub and bar door restrictions are now in place across inner Sydney party spots. The NSW government’s promised 3am last drinks and 1.30am lockouts for CBD and Kings Cross licensed premises came into effect at 12.01am (AEDT) on Monday (24 February 2014). A statewide ban on takeaway alcohol sales after 10pm is also in place. Hospitality Minister George Souris says the introduction went smoothly. “I haven’t had one report,” he told ABC Radio on Monday morning. The new laws will undergo their first big test this Saturday, as the Mardi Gras parade brings hundreds of thousands of people to inner city streets. Mr Souris said he understood concerns the new lockouts would prompt late-night migrations to city fringe suburbs but said the system was flexible and boundaries would be tweaked if necessary. “I think it’s warranted but the area that we’re talking about, the Sydney entertainment district, the CBD including Kings Cross and so on, is a very, very large area,” he told the ABC. When a similar regime of lockouts and last drinks were introduced in Newcastle, he said, “there wasn’t that venue-morphing going on” between the restricted city premises and pubs and clubs in nearby Hamilton. “I’m pretty sure most people will get the message and I just ask people to be more compliant generally in their nature, to understand the new emphasis this puts on personal responsibility,” Mr Souris said. There are about 1300 licensed premises within the designated Sydney precinct but some are exempt from the new restrictions. Police are appealing for public assistance following the assault of a man in Manly. About 11.45pm (Saturday 15 February 2014), officers attached to Northern Beaches Local Area Command attended a hotel on Market Lane after reports of an assault nearby. Investigators arrived to find a 29-year-old man with suspected head injuries at the location. Officers have been told the injured man was with another man when the pair was approached and assaulted by a group of men. The 29-year-old man was knocked unconscious during the alleged assault and treated by NSW Ambulance Paramedics, before being taken to Royal North Shore Hospital, where he remains in a stable condition. The other man sustained minor facial injuries, but declined medical treatment. Inquiries into the matter are continuing and anyone who may have witnessed the incident and has not yet spoken to police is urged to come forward. A SECURITY guard who killed a man during a “dramatic and violent” melee in Kings Cross has been jailed for at least 18 months. Wilson Duque Castillo, 33, was knocked unconscious after becoming embroiled in a confrontation involving his brother and security guards on the late-night strip on December 18, 2010. He died in hospital two weeks later. Following a trial last year, one of the guards, Lynn Matia, was found guilty of his manslaughter. In sentencing Matia on Friday, Judge Ian McClintock said there was no consistent or reliable narrative of what happened during the “extremely dramatic and violent events” of that night. What was clear was that a tussle broke out when Wilson’s brother Wilmer Duque Castillo and one of their colleagues were refused entry at the Trademark Hotel. When Matia told them to leave, Wilmer showed him his paint scraper, which he had been using at work. “There’s no doubt that at this point he (Matia) was well in his rights to defend himself,” Judge McClintock told Sydney’s District Court. After a brief altercation outside the hotel, other security guards began a slow and “relentless” pursuit of Wilmer down Darlinghurst Road. Wilson then became involved, trying to placate the situation. It wasn’t until Wilmer struck out at ex-NRL star and security guard John Hopoate that Matia became involved, Judge McClintock said. As Wilson went to defend his brother, the judge said Matia performed an “isolated act of violence” and delivered the fatal punch on the 33-year-old. The attack was “spontaneous”, and at a time when Matia had little time to reflect on its possible consequences. Judge McClintock said Matia had acted in “excessive self-defence of another”. Matia, the court heard, was otherwise a “pro-social”, gentle man, who cared for his mother full-time. He had also expressed “wretchedness” in what the fatal attack had done to his and Wilson’s family, the court heard. He was sentenced to a maximum of five years, but will be eligible for parole in August next year. Speaking outside court, Wilson’s wife Raquel Castillo said Matia would be able to spend time with his son in 18 months, while hers would never get that chance. Howard Brown, founding member of Victims of Crime Assistance League said the decision reflected the inherent problems in sentencing people for fatal “one-punch” assaults. He said the courts needed a guideline judgment, not the mandatory sentences which the state government recently introduced. It was “a joke” that Matia could get 18 months, while “someone who is drunk, who doesn’t intend to hurt anyone, is going to face a minimum sentence of eight years,” he said. Police have arrested two men in relation to a bottle shop armed robbery near Lake Macquarie last night. About 7.30pm (Saturday 8 February), a man armed with a knife entered a bottle shop on Walmsley Street in Dora Creek. The man threatened staff and left the scene with cash and a bottle of alcohol. He left the scene in a dark green Holden which was being driven by another man. A highway patrol officer from Tuggerah Lakes Local Area Command stopped the Holden for a traffic offence on Wyee Road. He discovered the car matched the description of the one used in the robbery and both men inside were arrested. The pair, aged 34 and 29, were taken to Toronto Police Station. Police are appealing for information after an armed robbery at a licensed club in Sydney’s south-west overnight (Friday 7 February 2014). About 10.30pm two males forced their way into the club on Margaret Street at Belfield as it was closing for the day. The men, one of whom had a firearm, threatened a male and female staff member and demanded money. The men left the club with a sum of cash and were last seen running along Margaret Street. Police from Campsie Local Area Command and the Dog Unit searched the nearby streets for the men but were unable to locate them. The two employees were not hurt during the robbery. One of the men was described to police as being of Pacific Islander/Maori appearance, 173cm tall and aged in his mid-twenties. He was last seen wearing a navy blue hooded jumper, dark track pants, sunglasses and carrying a black bag. The second man has been described as being of Middle Eastern/Mediterranean appearance, aged in his mid-twenties, 170cm tall and of thin build. When he was last seen the man was wearing dark pants and a grey hooded jumper. His face remained covered during the robbery. About 12:30am Sunday the 9th of February 2014, police attended a licensed premise on Wingecarribee St, Bowral to conduct a walkthrough of the premises. Police observed security declining entry to a 44 year old male from Moss Vale due to his level of intoxication. The male was instructed to leave the area but ignored the direction of security. Police then spoke further with the male and gave him a further direction which the male again refused to obey. The male continued to argue and became aggressive with Police. The male was subsequently advised he would be issued with an infringement notice for “Excluded person remain in vicinity of licensed premises”. The male then complied with the direction. This infringement attracts a $550 fine. About 0210am on Sunday 09/02/2014 a 37 year old male was moved on from a night club in Goldsmith Street Goulburn due to his level of intoxication by security and then by police. About 0230am police returned to the location and saw the same male urinating in the garden area at the location in full view of the public. The male was subsequently issued with infringement notices for failing to comply with a direction and for offensive behaviour. A MAN accused of punching another man to the ground and fracturing his skull after an argument at a hotel in NSW’s central west has been charged. Police say two men had been drinking separately at a hotel in Parkes when they began arguing at about 10.30pm (AEDT) on Sunday 26 Januray 2014. A 23-year-old man was punched in the stomach and head, causing him to fall over and hit his head on the ground. He was flown to Sydney’s Westmead Hospital where he remains in a critical but stable condition with a fractured skull. Police said that at about 10.20am (AEDT) on Monday a 19-year-old attended Parkes Police Station where he was charged with reckless grievous bodily harm, and assault occasioning actual bodily harm. A man has been charged following a glassing in Leeton. About 12.30am (Saturday 25 January 2014), a 19-year-old man was at a hotel on Pine Avenue with friends when a fight broke out between them. A 23-year-old man then allegedly threw a glass at the younger man, hitting the side of his head. The injured man was taken to Leeton Hospital to be treated for cuts to his ear and head. The older man also attended Leeton Hospital to be treated for a cut to his hand. He was later arrested and charged with malicious wounding. A man is expected to undergo surgery on his hand after allegedly hitting another man with a glass while drinking in a hotel in Narellan. A 24-year-old man sustained a minor cut to his head after he was allegedly hit with a schooner glass at the hotel on Camden Valley Way about 10pm (Friday 24 January 2014). The man, from Spring Farm, was treated at the scene by NSW Ambulance Paramedics for a cut to his head. The alleged offender, a 21-year-old man, was taken to Campbelltown Hospital with a severe injury to his right hand, incurred during the alleged assault. Police have been told the Narellan man will now need to undergo surgery. They intend to speak with him once he is deemed well enough. Tough New Measures to curb ‘Alcohol-Fuelled Violence’. NSW Premier Barry O’Farrell says the Government is set to introduce a raft of new measures to curb alcohol-fuelled violence. Lockouts for the Sydney CBD and Kings Cross and an eight year mandatory minimum sentence for drug and alcohol affected one-punch assaults will be introduced as part of the NSW Government’s comprehensive package to make streets safer. Parliament will meet next week to implement some of the measures as quickly as possible. 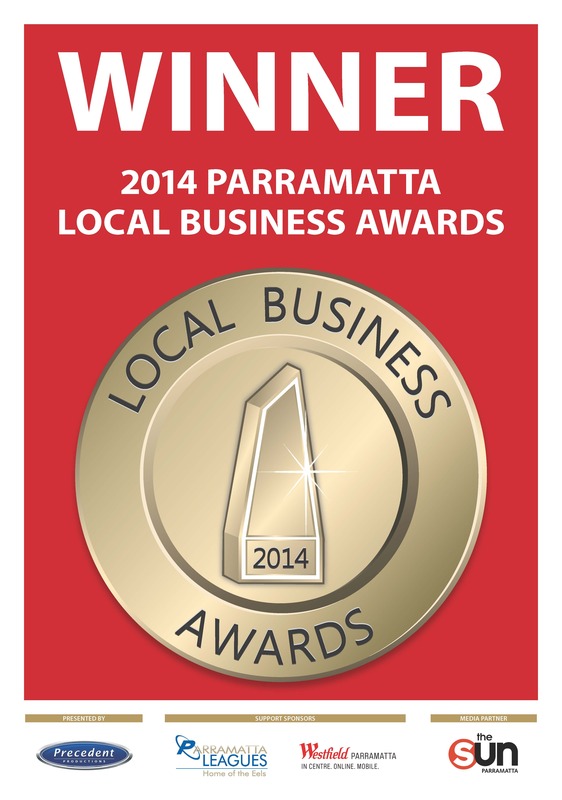 • A precinct-wide freeze on liquor licences for new pubs and clubs will be introduced. A proposal to alcohol and drug test suspects after a violent assault has gained early support following the death of Sydney punch victim Daniel Christie. It’s expected NSW Bureau of Crime Statistics director Don Weatherburn will suggest to the state government that it allow police to carry out the testing, Fairfax Media reports. The tests would be done following assaults that end in hospitalisation. NSW Council for Civil Liberties president Stephen Blanks has also indicated support for the plan but with restrictions. The testing should only be carried out once charges have been laid, Mr Blanks told AAP on Sunday. “This proposal is targeted at people who have been charged with serious offences,” he said. However, some police interviews for violent offences can take several hours before charges are laid. Despite the fact that it can take several hours before charges are laid for some violent offences, Mr Blanks said until police were in a position to charge someone, there was no justification in testing. Mr Blanks said when an accused did not give consent to be tested, an authority independent of the police could provide the consent. He gave the example of a magistrate approving requests for DNA testing. Acting Opposition Leader Linda Burney told reporters on Sunday people would be surprised the alcohol and drug testing proposal was not already the case. In a statement, Ms Burney said the Opposition would consider any “sensible measure to help stop” alcohol violence. “However we need to listen to the experts and address the availability of alcohol in the community,” she said. The proposal for greater police powers comes a day after Mr Christie died in hospital. His family turned off his life support on Saturday (11 January 2014) afternoon. Mr Christie was punched in Kings Cross on New Year’s Eve. Attorney-General Greg Smith has asked the director of public prosecutions to assess if a murder charge against Christie’s alleged attacker, Shaun McNeil, is appropriate. He was hit just metres from the spot where Thomas Kelly, 18, was punched in 2012. Mr Kelly also died in hospital. Police are investigating the robbery of a hotel in Sydney’s south west. About 7.40am (Saturday 11 January 2014), an employee was confronted by a man while working at a hotel on Waldron Road at Chester Hill. The man threatened the employee, a 21-year-old man, demanding money and stating he had a firearm. He fled with a large sum of cash and police were alerted. No one was injured during the incident. Officers from Bankstown Local Area Command attended, established a crime scene and commenced inquiries. Investigators have been told the man was seen loitering outside the hotel for about 30 minutes prior to the robbery. He is described as being of Pacific Islander / Maori appearance, approximately 190cm to 200cm tall, aged in his 30s and with a muscular build. He was wearing black pants, a yellow reflective vest and a black hat with the word ‘SECURITY’ written on it. Two security guards are due to appear in court today after allegedly indecently and sexually assaulting two teenage girls at Campbelltown on the weekend. On Sunday 5 January 2014, two girls, aged 13 and 17, were at a shopping centre on Gilchrist Road when they were approached by two security guards. Police will allege the men escorted them from the shopping centre into another area. The men then allegedly indecently and sexually assaulted the girls. The girls returned home where they informed their parents. Police from Campbelltown Local Area Command were contacted and commenced investigations into the alleged assaults. Yesterday afternoon (Thursday 9 January 2014), detectives attended two houses in Ingleburn where they arrested two men, aged 21 and 50. Both men were taken to Campbelltown Police Station where they were spoken to by police. They were charged with detain for advantage (two counts), aggravated indecent assault (two counts) and aggravated sexual assault (two counts) and refused bail to appear in Campbelltown Local Court. Two police officers have been injured and 16 people were arrested during Day One of Operation Rushmore III, an ongoing, multi-agency operation targeting anti-social behavior and alcohol-related crime in the CBD and surrounding suburbs. On Day One of the operation police conducted more than 80 person searches, with 89 people issued move on directions and 11 later charged over a number of different offences. Specialist officers utilized drug dogs to search a further 42 people, with 16 later charged over illegal drug possession, three over alleged drug supply and a final three people issued cannabis cautions. Police patrolled 140 licensed premises with more than 90 breaches detected during various inspections. Two police officers attached to Sydney City Local Area Command were injured while arresting a person over alleged aggressive and offensive behavior on Sussex Street in the Sydney CBD. Operation Rushmore III will continue tonight with further deployments and police operations targeting alcohol related violence planned over the holiday period and into next year. Police have arrested 25 people during the second evening of an ongoing, multi-agency operation targeting alcohol-related crime and anti-social behavior in Sydney’s CBD and surrounding suburbs. During the second evening of the operation, 213 people were searched with 25 people arrested and 14 charged. In addition, 125 move-on orders were issued along with five cannabis cautions and 148 premises inspected. Just after 3.30am, police were called to Taylor Square at Surry Hills after reports a number of people were fighting with a security guard. Two men and a woman were arrested and taken to Surry Hills Police Station where they were charged with affray. Investigations are continuing into the matter and further charges are expected. Throughout the operation a total of 41 people were arrested; 25 charged; 347 people searched; and 214 move-on orders issued. A man will appear in court tomorrow after being charged with the serious assault of another man in Dubbo today. Police will allege the assault took place about 1.20am (Sunday 22 December, 2013), outside a hotel on Talbragar Street, when a 21-year-old man punched a 24-year-old man in the side of the head. As a result of the punch, the older man suffered a suspected broken jaw and was taken to Dubbo Base Hospital for treatment. The younger man attempted to walk away from the scene before being detained by security staff. Officers from Orana Local Area Command, who were patrolling the area at the time, were flagged down and arrested the man. He was taken to Dubbo Police Station where he was interviewed and later charged with assault occasioning grievous bodily harm with intent. Three men have been arrested after a police officer was injured while attempting to remove a patron from a hotel in Botany today. Officers from Mascot were called to a hotel on Botany Bay Road, shortly before 7pm (Monday 23 December, 2013), after a patron refused to leave. An Acting Sergeant and two Senior Constables attended and while assisting the male patron outside, other patrons began to argue with the officers. A scuffle ensured between the officers and at least three patrons, and police will allege one of the patrons spat on and punched the Acting Sergeant in the head before running from the hotel. Officers called for further assistance and the 22-year-old man was arrested not far from the hotel. Police arrested a further two men, aged 36 and 40. They were all taken to Redfern Police Station where the 22-year-old was charged with two counts of assault occasioning actual bodily harm to police. The Acting Sergeant suffered a laceration to his head and was taken to Prince of Wales Hospital for treatment. The other officers involved were not hurt. Three men have been charged following a glassing incident in Oatley last night. About 11pm (Tuesday 24 December 2013), a 22-year-old man was at a hotel on Oatley Avenue when he allegedly became involved in an altercation with another man and three of his friends. The man’s friends then allegedly assaulted the 22-year-old, striking him with a broken glass bottle. Police were called and the three men, two aged 21 years and one aged 19 years, were arrested. The injured man was taken to St George Hospital to be treated for a cut to his head and concussion, and later released. Four people have been charged following a brawl outside a nightclub in Sydney this morning. About 4.30am (Friday 27 December 2013), police were called to a nightclub on Pyrmont Street, Pyrmont, following reports of a brawl. Police from Sydney City Local Area Command attended and located three women and two men fighting in the foyer. Officers broke up the fight and the group was separated. No one was injured. Three women – aged 19, 20 and 22 – and a 20-year-old man were arrested and taken to City Central Police Station, where they were charged with affray. An English backpacker was left unconscious after being punched outside a hotel in Coffs Harbour on the weekend. Police have been told about 11.55pm (Saturday 28 December 2013) a 19-year-old man approached a 29-year-old man at the corner of Grafton and West High Streets, allegedly head butting the older man from behind. The older man was then allegedly punched twice and knocked to the ground. Emergency services were called and the man was taken to Coffs Harbour Base Hospital in a stable condition. The younger man fled and police established a crime scene, with CCTV footage examined. Police continue their investigations into the incident and hope to speak to a 19-year-old man this week. It is believed the injured man did not know his attacker. A man will appear in court following a fight in Redfern yesterday. About 10pm (Sunday 29 December 2013), two men, aged 37 and 39, were at a hotel on Cleveland Street when a fight took place between them. Police have been told during the altercation, the older man suffered cut wounds to his face from a broken bottle. Police were called and arrested the younger man a short distance away. He was taken to Redfern Police Station and charged with affray. More than 170 people have been arrested across the state during New Year’s Eve celebrations. Operation Cadman saw more than 3000 police officers deployed Statewide to provide a safe environment for the community to celebrate the arrival of 2014. During the operation, 173 people were arrested and charged with 222 offences, including robbery, assaults, street and drug-related offences. In addition, ten people were taken by police to the Sydney City Sobering Up Centre. More than 400 people were treated by St John Ambulance volunteers and more than 460 people received assistance from NSW Ambulance Paramedics for a range of injuries, mostly due to falls, assaults or intoxication. A man will face court next month following the alleged glassing of a man at a premises in Kiama overnight. About 12.45am (Wednesday 1 January 2014), a 25-year-old man was asked to leave a licensed premises on Terralong Street, by security guards at the location. The man allegedly refused to leave and was escorted from the hotel a short time later. It’s further alleged the man threw glass bottles at security guards outside, hitting a 26-year-old man in the back. Police from Lake Illawarra Local Area Command attended and launched an investigation into the incident. A 25-year-old man was arrested outside the hotel and taken to Lake Illawarra Police Station. The 25-year-old man allegedly assaulted police while being arrested, along with a 30-year-old man and 20-year-old woman. The older man and woman were arrested and taken to Lake Illawarra Police Station, where they were charged with assault police officer in execution of their duty and resist arrest. They were both issued a Field Court Attendance Notice to appear before Kiama Local Court on Wednesday 19 February, 2014. The younger man was charged with reckless wounding, assault occasioning actual bodily harm, resist arrest (two counts), assault police officer in execution of their duty (two counts) and fail to leave licensed premises. The injured man was treated by NSW Ambulance Paramedics for cuts to his back, before being taken to Shellharbour Hospital. He has since been released. Police are attempting to locate a man who allegedly threatened security guards at shops in Parklea this afternoon. About 2:20pm (Friday 3 January 2014), police were called to a marketplace on Sunnyholt Road following reports of a man armed with a firearm. Police have been told the man threatened security guards before fleeing the scene in a car. No shots were fired during the incident and no injuries reported. Detectives from Quakers Hill Local Area Command are continuing investigations into the matter and are looking for the man who fled in a purple or blue-coloured Proton Satria hatchback with distinctive black bumper bars. The man is described as being of Caucasian appearance, aged in his mid 20s, with a solid build and wearing a hat, orange/fluorescent high-visibility top and blue shorts. Members of the public who sees the car or the man is urged not to approach but ring Triple Zero (000) immediately. A man has been charged after a woman was allegedly punched in the face at The Rocks overnight. Police have been told two women had been ejected from a nightclub in George Street by security about 10.30pm (Saturday 4 January 2014), after an argument. The two crossed paths again near the intersection of Hickson Road, where the argument resumed. Police allege a man – who was with one of the women – punched the other woman in the face, knocking her to the ground. Police patrolling the area were flagged down by the injured woman who pointed out her alleged attacker. Police chased a man 50m along George Street before he was stopped and arrested. He was taken to Day Street Police Station where he was charged with assault occasioning actual bodily harm, and resist police. The woman, from Campsie, was taken to St Vincent’s Hospital where she was treated and released. Police are investigating after an alleged argument and scuffle outside a pub this morning in Gosford. About 2.30am (Sunday 5 January 2014), two men, were outside a hotel on Donnison Street, arguing. Security moved the men around onto Mann Street, one left in a taxi and a 33-year-old man has then allegedly confronted security. Police were called and officers from Brisbane Water Local Area Command attended. The man then allegedly lunged at security officers, police intervened and the man fell to the ground. NSW Ambulance Paramedics attempted to treat the man, he was placed in the ambulance where the man allegedly became aggressive and got out of the ambulance. Police assisted by taking the man to Gosford Hospital, where he was treated and has since been released. Officers are continuing to investigate the circumstances surrounding the incident. A man has been charged over the robbery of a licensed premise in Sydney’s south west. Police were called to a club on Olympic Parade, Bankstown, just after midnight on Monday (6 January 2014), after reports of a robbery. Officers from Bankstown Local Area Command attended and were told a man had handed a note to the cashier, a 19-year-old woman, stating he was armed and demanding money. He was handed a sum of cash before fleeing the area in a white Mitsubishi Lancer. Police reviewed CCTV footage and will allege the man was observed attempting to open one of the poker machines prior to the robbery. About 7.30pm yesterday, security staff alerted police when they saw the Mitsubishi drive along Brandon Avenue. Officers attended and arrested a 51-year-old man at a nearby house. Further inquiries revealed the man is a member of the club and showed his membership card when he entered. The Minister for Tourism, Major Events, Hospitality and Racing, and Minister for the Arts, the Hon George Souris MP, has today (13th December 2013) released the report on the review of the Liquor Act 2007 and the Gaming and Liquor Administration Act 2007. The report will also be tabled in each House of Parliament on the next available sitting day. In addition, the report has been emailed to all members of Parliament, and all submission makers have been advised of the availability of the report. Police have arrested 282 people across New South Wales on the second night of the Operation Unite blitz on alcohol-related crime and anti-social behaviour. Operation Commander, Gary Worboys, has praised the good behaviour of the wider community but expressed concern about the high number of ‘Fail to Quit’ and ‘Common Assault’ offences in and around licensed premises. “One of the biggest problems we’ve noticed during the operation this year is the refusal by many people to leave pubs and clubs when asked by security,” Assistant Commissioner Worboys said. “Some of these people think they have a right to enter or remain on the premises when they’ve been identified as drinking too much,” he added. “They want to argue, often punches are thrown and then police get involved. “Anyone who fails to leave licensed premises when requested is liable for a $550 fine…an assault may well get you a lifelong criminal conviction and possible jail time,” the Assistant Commissioner said. Of those arrested overnight, 58 were charged with assault and 87 with ‘Fail to Quit’ offences. 567 charges were laid on the second night of Unite. Police conducted 19,999 Random Breath Tests on night two and booked 157 for drink-driving. 16 people were charged with driving whilst disqualified. In total, 540 people were arrested in NSW during this year’s blitz and 1062 charges laid. There were 40,373 random breath tests conducted and 268 people booked for drink-driving. There were 548 arrests and 966 charges during the same crackdown last year. Police quickly dealt with a steady stream of fights and assaults overnight, particularly in and around the Sydney C.B.D. – Six men have been arrested after an alleged scuffle with Police outside a hotel in Darlinghurst. Officers were conducting licensing duties along Oxford Street around 2.30am (Sunday 15 December 2013) when they directed a group of men to get off the road. It’s alleged at least one of the group, which had just been ejected from a club, refused to move. When officers forcibly moved him to safety, they were confronted by the rest of the group. Police were forced to produce a baton and OC spray during the disturbance that followed. The six men were taken to Surry Hills Police Station to assist with inquiries. One officer suffered a dislocated thumb and another a facial injury during the incident. – One woman has been knocked unconscious and another had her two front teeth knocked out during a violent 21st birthday party at Doyalson, on the state’s Central Coast. It’s alleged an argument broke out around 12.40am (Sunday 15 December 2013) as 150 guests attended the party in Wyee Road. Police allege two men were initially involved in the disagreement. The two women tried to break-up the altercation when they were both allegedly punched by a 21-year-old man. He was restrained by other guests until the arrival of police who have since charged the man with affray. Investigators believe alcohol played a large part in the incident. – Police have been pelted with rocks while breaking up a large party at Cabarita Beach at Tweed Heads, in the state’s far north. Just before midnight (Saturday 14 December 2013), police from the Tweed/Byron Local Area Command moved in to disperse the unauthorised gathering of around 200 revellers, ranging in age from 14 to 20. Officers allege that empty alcohol bottles, beer cans and rubbish littered the sand and beach path area. An unknown person threw a rock that smashed the windscreen of one police caged truck. A group of youths then joined in, throwing rocks at other police vehicles, including a passing patrol car. Officers remained at the scene as all the revellers moved on. – A bar manager was struck in the face with a stool, thrown during a brawl involving four men in a hotel at Martin Place. The incident occurred just before 2am (Sunday 15 December 2013). The manager was admitted to Sydney Hospital for stitches to his eyebrow. Sydney City detectives obtained CCTV footage of the incident and later charged a 35-year-old man with affray. – A man’s been knocked unconscious during a brawl at Darling Harbour. The fight broke out between two men in King Street around 3.45am (Sunday 15 December 2013). Police were quickly called to the scene and found a man, aged in his early 30’s, lying on the ground, bleeding from the mouth. Investigators from Sydney City Local Area Command are trying to determine whether he was punched and/or stomped on. He was taken to hospital for treatment to facial injuries, which are not considered life-threatening. Investigations are continuing. – Police have been forced to use OC spray to arrest a man after two assaults in a hotel at Leeton in the state’s Riverina. Officers were handcuffing the man, who had allegedly assaulted two other men in a beer garden, when the 22-year-old began struggling violently and broke free. Upon his subsequent arrest, Police discovered the Leeton local was already on bail for an alleged glassing incident in March. – Police have discovered more than 200 alleged licensing breaches during a single inspection overnight at Wagga Wagga in the state’s Riverina. Local Licensing officers have issued an immediate direction to close the club and cease trading. – Police have shut down a drunken teenage birthday party at Queanbeyan. Officers from Monaro Local Area Command attended a hall in Atkinson Street around 9.30 last night. They spotted large amounts of alcohol on tables set up outside the hall and a large number of intoxicated people, allegedly including underage teens. The officers claim there appeared to no responsible adults present and no security on duty. As up to 150 guests of the three joint 18th birthday celebrations began leaving, a beer bottle was thrown at supervising police. Police are investigating an attack that’s left a man fighting for his life in a Sydney hospital. Officers were called to Campbell Parade at Bondi about 1.45am (Saturday 14 December 2013) and located a 23-year-old man lying semi-conscious on the ground. Police were told he had been punched by another man who then stomped on his head. The victim is believed to have been drinking with dozens of other people in a park adjacent to Bondi Beach prior to the attack. He remains in an induced coma in St Vincent’s Hospital where his injuries have been described as life-threatening. Investigations are continuing. It was one of several violent, alcohol-related incidents that have angered senior police on the first night of Operation Unite. New South Wales Police arrested 213 people and laid 424 charges during the opening phase of the two-night Australasia-wide police blitz. Officers conducted 14,618 random breath tests and booked 88 motorists for drink-driving. Another eight were booked for driving whilst disqualified. Seven people were admitted to sobering up centres by police in Sydney and Wollongong. While most revellers behaved themselves, police have expressed concern about a number of isolated acts of alcohol-related violence. “Despite all our warnings and the scores of extra police on patrol right across the state, a handful of people have set out to harm others,” NSW Operation Unite Commander, Assistant Commissioner Gary Worboys, said. – A man has almost had his ear severed in an alleged glassing attack at a hotel at Albion Park Rail, south of Wollongong. Police were called to the pub on the Princes Highway about 10pm yesterday following reports a man had been king-hit and later glassed. They located a woman celebrating her 21st birthday. She had allegedly been punched in the mouth by a man holding a glass bottle and suffered a cut upper lip. Police then found the second victim, a 28-year-old man, who allegedly had been struck with the bottle in the right ear, causing a severe laceration. Three men have been taken into custody and are assisting Lake Illawarra detectives with their inquiries. – Police at Leichhardt Local Area Command are investigating a king-hit attack that knocked a man unconscious overnight at Rozelle. It’s believed the 48-year-old victim was followed outside a hotel at the corner of Darling and Red Lion Street and punched in the head from behind. He fell to the ground unconscious. Police and ambulance paramedics were called and a crime scene was established. The victim was admitted to the Royal Prince Alfred Hospital, his condition is being further assessed. Leichhardt Detectives are investigating. – A 32-year-old man has been arrested and admitted to hospital for mental health assessment after allegedly striking an officer over the head with a chair at Bonnyrigg in Sydney’s south-west. About 10.30pm yesterday, Police tried to pull over a vehicle without its headlights on, however it allegedly continued along Elizabeth Drive, initiating a short pursuit. Officers confronted the driver at a nearby club when it’s alleged he attempted to assault police. Officers used OC spray but the man ran inside the club. When the Traffic and Highway Patrol officers chased him into a function room, it’s alleged he struck a senior constable over the head with a chair. The policeman received a small wound to the head. Another officer deployed his Taser and took the driver into custody. – Police are investigating a reported stomping incident during an alleged attack in a Sydney nightclub. The victim told police he and a friend were set upon by four men about 11.30pm yesterday near the corner of Market and Sussex Streets. It’s alleged the man was punched to the ground and stomped on the head. He was treated at the scene. – Police at Olympic Park in Sydney have arrested a man they alleged deliberately urinated on a Highway Patrol car. Officers were awaiting the arrival of an ambulance to tend to an intoxicated man after a concert around 11.30pm yesterday when it’s alleged another man walked to the rear of the police car and as its lights flashed, relieved himself. The police officers were standing a few metres away and immediately arrested the 26-year-old man from Kellyville Ridge. He has been issued with a Criminal Infringement Notice for offensive behaviour. – A man has been arrested over the alleged possession of a replica pistol and drugs during a search by Public Order and Riot Squad officers at Kings Cross. The PORS officers had stopped the man in his vehicle last night for a random breath test. They searched the man, allegedly locating the weapon in his underwear. They also allegedly found a small amount of crystal methamphetamine (ICE) on his person. The driver was taken into custody and investigations are continuing. – A man has been arrested within seconds of a king-hit attack this morning at Kings Cross. The victim was standing by Darlinghurst Road just before 3am when he was allegedly punched in the face. Two Police Rescue officers were standing several metres away and witnessed the alleged assault. They quickly responded, along with local uniformed officers, and arrested the suspect, who is assisting with inquiries at the Kings Cross Police Station. – A 25-year-old man was knocked unconscious after falling two storeys from a hotel balcony at Neutral Bay last night. The incident occurred about 9.15pm. The man was treated at the scene for a head wound. – A woman was lucky to escape serious injury after falling out of a moving taxi early this morning in Darlinghurst. When police arrived at the scene in Oxford Street, they were told the cab failed to stop after the incident. The woman received minor injuries and refused medical treatment. Police from Ashfield Local Area Command have charged a man, who will appear in court next year, over an alleged fraud at a local hotel. Police from Ashfield Local Area Command have been investigating claims that a hotel in Hurlstone Park had been the victim of a large fraud between September 2009 and early February 2012. As a result of their investigations, police identified numerous alleged fraudulent transactions by a senior employee of the hotel. Investigators will allege that large quantities of money from poker machines and an ATM were illegally obtained. Today (Wednesday 11 December 2013), officers arrested a 31-year-old man at Kings Cross Police Station. The man was charged with larceny as a servant x 2. A man remains in hospital after the top of his finger was severed during a pub fight in the city. Police from Sydney City were called to a hotel on George Street about 9.50pm (Monday 9 December, 2013) following reports of an assault. Upon arrival officers located a man suffering a lacerated finger, and lacerations to his head. He was treated at the scene before being taken to Sydney Hospital for surgery. Early investigations conducted by detectives suggest the 25-year-old man was attempting to break up a fight that broke out between two men at the hotel. A crime scene was established while forensic police gathered physical evidence for further examination. At this stage the men involved in the fight have only been described as being of Asian appearance. A local Armidale licensed premises owner has been arrested and charged with allegedly providing fraudulent information in an application to obtain a liquor license. In April 2013, a 39-year-old man allegedly submitted an application to the licensing police attached to New England Local Area Command. Since the grant of the license for the Beardy Street premises police have attended a number of alcohol related incidents. The licensing police commenced an investigation and will allege the man provided fraudulent details to obtain the license. About 6.40pm Friday 6 December 2013, police arrested the man in Armidale. He was taken to Armidale Police Station where he was charged with dishonestly obtain financial advantage by deception. Police also executed two search warrants where they seized financial documentation and computer equipment. Investigations are continuing and police are working in conjunction with the Independent Liquor and Gaming Authority. A man sustained facial injuries after being struck with a glass during a function at a licensed club in Mortdale. Police were called to the business on Boundary Road about 11.00pm (Saturday 7 December 2013), responding to reports of a fight involving two men. They arrived to find a 19-year-old man had sustained cuts to his face after allegedly being struck with a schooner glass during an argument. He was treated at the scene before being taken to St George Hospital. Police spoke with a number of people at the scene and are now appealing for information about the incident. Three people are facing more than 50 fraud charges, following joint investigations between NSW Police and a number of insurance companies. In June this year, police attached to Burwood Local Area Command formed Strike Force Ashwell to investigate allegations of a racket which involved coordinating motor vehicle collisions and the lodging of false insurance claims. Police believe the fraudulent insurance claims in connection with the racket amount to more than $500,000. Joint investigations between police and a number of private insurance companies led detectives to arrest a 30-year-old man at a business in Burwood on Monday 11 November 2013. He was later charged with 18 counts of fraud relating to alleged staged or nonexistent motor vehicle accidents. He was granted conditional bail and will appear at Burwood Court on Tuesday 14 January 2014. On Tuesday 26 November 2013, further investigations led police to arrest a 51-year-old woman, and yesterday (Wednesday 27 November 2013), police arrested a 44-year-old man. They were both charged with 18 counts of fraud relating to alleged staged or nonexistent motor vehicle accidents. The woman was granted conditional bail and will appear at Burwood Local Court on Thursday 12 December 2013. The 44-year-old man was granted conditional bail and will appear at Burwood Local Court on Thursday 19 December 2013. Police investigations into the incident continue. Police are investigating the armed robbery of a licensed club at Coffs Harbour. About 9:30pm, Sunday 1 December 2013, a woman was working at the club on Jordan Esplanade when she finished her shift and walked to the car park. Police have been told three men threatened her with a knife before forcing her to open the doors to the club where another employee was in the process of closing up. The man and woman were forced into the office before the trio stole cash and fled the premises. No one was injured during the robbery. Detectives from Coffs Harbour are investigating the incident. Police are appealing for public assistance following an armed robbery at a hotel in Eastwood. About 1pm (Sunday 1 December 2013), a 21-year-old woman was working at a hotel on West Parade, when she was approached by a man with a knife. The man threatened her with the weapon, before fleeing the location with cash. He was last seen running north along West Parade. No one was injured during the incident. Officers attached to Eastwood Local Area Command were alerted and attended the location a short time later. A crime scene was also established and examined by specialist forensic officers and detectives. Inquiries into the matter are continuing and police would now like to speak to a man who they believe may be able to assist in the investigation. Police have charged a man following several violent incidents in the city. About 2.40am, (Saturday 30 November 2013), a 47-year-old man was seated in the driver’s seat of a black BMW sedan on the corner of Sussex and Slip Streets, Sydney. A man approached the vehicle pushing the driver into the passenger seat and attempted to start the BMW. Security officers from a nearby hotel intervened and pulled the intruder from the car but he was able to run away. The man then entered a licensed venue on Lime Street. When he attempted to leave through the front door, the man allegedly assaulted a security guard in an unprovoked attack. Several other security officers tackled the man a short distance away and restrained him. Police from Sydney City Local Area Command arrived a short time later. The man, who had suffered a head injury, was treated at the scene and taken to St Vincent’s Hospital under police guard. This afternoon, the 39-year-old man was released from hospital into the custody of police. He was subsequently charged with carjacking, assault occasioning actual bodily harm and common assault. Police are appealing for public assistance following an armed robbery at Kingsgrove. About 1am (Saturday 30 November 2013), two men armed with a shotgun and knife entered a hotel on Kingsgrove Road. The pair threatened patrons and staff members, before demanding cash. They later fled the location with cash in a green-coloured Ford and were last seen driving south along Kingsgrove Road. Officers attached to St George Local Area Command were alerted and attended the location a short time later. A crime scene was established and examined by specialist forensic officers and detectives. Inquiries into the matter are continuing and police would now like to speak to two men who may be able to assist with their investigation. Three men have been charged with murder following investigations into the death of a 45-year-old man in Maroochydore. It will be alleged the man sustained head injuries after being assaulted outside the Factory nightclub on Horton Parade around 3.10am on Saturday 30 November 2013. The men reportedly attacked the victim following an argument. He was knocked to the ground, then kicked and punched in an attack that lasted less than 20 seconds and was captured on CCTV cameras. The man was transported to Nambour General Hospital where he was pronounced deceased. A 24-year-old North Arm man and two 27-year-old men from Buderim and Coolum were each charged with one count of murder. Detectives are still appealing for anyone who may have witnessed the incident to contact Sunshine Coast Police or Crime Stoppers. Police are appealing for information following a glassing incident in Dubbo. About 8.45pm (Friday 29 November 2013), a 27-year-old man and a 20-year-old man visited a bottle shop on Windsor Parade, where they were refused service. The 20-year-old man became aggressive towards the attendants and police were called. Shortly after, the two men left the shop and became involved in an altercation with three other men on the street, during which the 20-year-old man was struck with a broken bottle. The three men fled the scene. Ambulance Paramedics treated the injured man at the scene and he was taken to Dubbo Base Hospital to be treated for a cut to his left forearm. Police established a crime scene and are appealing for anyone with information to contact them. Police have arrested and charged a man over an alleged assault at Martin Place in Sydney last weekend. About 1:30am on Saturday 23 November 2013, police were called to Martin Place following reports of two men fighting. A 22-year-old Summer Hill man was found unconscious at the scene and treated by NSW Ambulance Paramedics. He was taken to St Vincent’s Hospital for treatment of a fractured eye socket. Detectives from Sydney City Local Area Command conducted investigations into the matter. About 1pm today (Friday 29 November 2013), a 24-year-old man attended Newcastle Police Station where he was arrested and charged with assault occasioning actual bodily harm and fail to quit licensed premises. He was granted conditional bail to appear in the Downing Centre Local Court on Monday 6 January 2014. Police have arrested and charged two OMCG members following an alleged incident at a licensed premises in West Ryde. About 9pm (Thursday 21 November 2013), officers attached to Ryde Local Area Command were called to a licensed premises on West Parade after reports a number of patrons were refusing to leave the location. Upon arrival, police directed a group of intoxicated men to leave the premises. After allegedly refusing to cooperate, a 26-year-old man was escorted by police from the location and arrested. Eight men have been charged over a violent incident at a Newcastle hotel which left several police officers injured. About 12.30am, (Sunday 20 October, 2013), police attended a hotel on Hunter Street after receiving information there were several intoxicated males at the hotel. Police arrived and allegedly spoke to a man who was aggressive and intoxicated. Police asked him to leave and it is further alleged he became abusive towards police. Two other males approached the police also becoming abusive. The three men were moved out of the hotel by police and security when a number of other men, believed to be friends of the trio, approached police. Police attempted to disperse the group when a melee broke out. A number of other police vehicles arrived at the scene and the manager of the hotel agreed to close the hotel. The crowd eventually moved on and no other incidents were reported. – 22-year-old from Jesmond charged with assault police, resist arrest, affray and offensive behaviour. All men have been granted conditional bail to appear at Newcastle local Court on 5 November, 2013. As a result of the incident a senior constable was hit to the face and was taken to John Hunter Hospital with an injury to his eye. Another officer suffered a twisted knee and several others had to be treated for the effects of OC spray. Superintendent Gralton said the Newcastle City Licensing Unit is considering further action in relation to licensing breaches by the hotel involved. NSW Police Force has welcomed the temporary closure of a hotel in Newcastle. Police successfully sought a 72-hour closure order on the Hunter Street licensed premises after eight men were charged over a violent incident that left several police officers injured last weekend. During this incident, the hotel’s manager agreed to close the premises for the remainder of trade. The owner of the licensed premises challenged the short-term closure order, obtained by police under Section 82 of the Liquor Act. However, today (Friday 25 October 2013), the Independent Liquor and Gaming Authority (ILGA) acted quickly, and supported the application by police in deciding to invoke the 72-hour closure of the hotel. Newcastle City Local Area Commander, Superintendent John Gralton, has welcomed the result. “We will not tolerate this sort of behaviour in our city,” said Superintendent Gralton. “This city’s culture is changing for the better and this type of behaviour is totally unacceptable. The vast majority of hotels and clubs are working positively with police against alcohol-related violence in Newcastle, with excellent results. “Today’s decision reinforces the strong stance taken by police, and we acknowledge the prompt response and decision made by the Independent Liquor and Gaming Authority,” he said. Police have arrested three men following a disturbance at a North Adelaide Hotel. At about midnight, (Saturday 26 October 2013), Eastern Adelaide patrols were called to the Old Lion Hotel after a group of men began fighting inside the hotel. Police arrived and requested several men to leave – three men were subsequently arrested for disorderly behaviour, hindering police and fail to leave licensed premises. Police have charged a 19-year-old man from Inala with grievous bodily harm following an incident this morning in Fortitude Valley. About 4.20am a group of people were refused entry to a licensed venue when a verbal altercation then took place. The 19-year-old man then allegedly punched a 31-year-old bystander in the face, knocking him to the ground before punching him again. The 31-year-old man remains in the Royal Brisbane Hospital with serious head injuries. Police from the Central Hunter Local Area Command are investigating the circumstances surrounding an armed robbery of a bowling club at Beresfield. About 9am today (Sunday 27 October 2013), a man entered a bowling club on Anderson Drive, armed with a firearm. He threatened the 23-year-old male employee, who was working behind the cash counter, and demanded money. The employee handed the man cash and he fled the club. Police attended and established a crime scene, which was examined by investigators. Police investigating an assault that occurred in Fortitude Valley on October 27 have released images of a man who may be able to assist with their inquiries. About 2.00am, a 36-year-old man was attempting to pay for drinks in a licensed premises on Ann Street when he was elbowed and punched. He was taken to the Royal Brisbane and Women’s Hospital and treated for facial fractures. 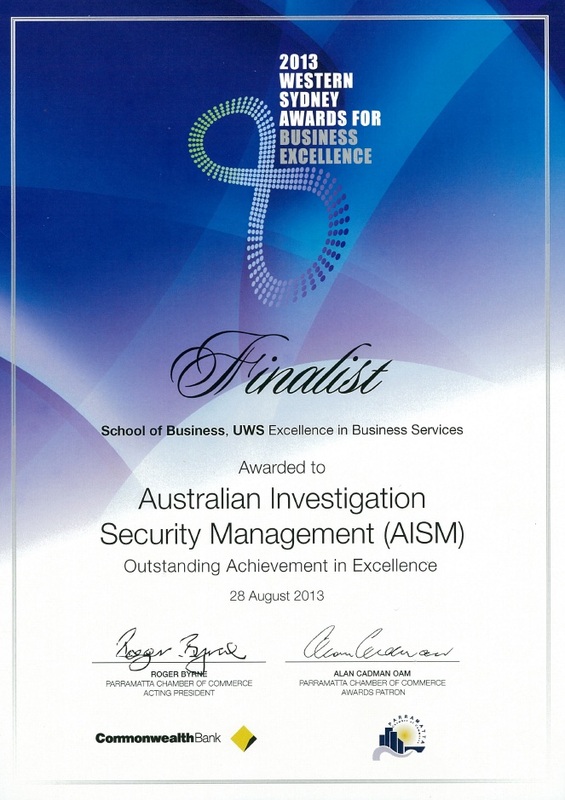 Congratulations to all the AISM Management and Staff, Good Luck !! !